Spinosaurus was a giant carnivorous (meat-eating) dinosaur that lived in the Cretaceous period, between approximately 112 and 97 million years ago. 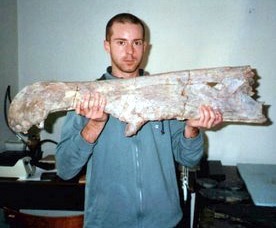 It may have grown as large as 41 to 59 feet (12.6 to 18 meters), and weighed somewhere between 8 and 23 tons. One of the most immediately recognizable features of Spinosaurus is the large "fin" (also sometimes called a "sail") on its back. Spinosaurus probably used this fin to help control its body temperature. It could face the fin towards or awa away from the sun, depending on whether it needed to heat itself up or cool down. Of course, Spinosaurus is not around any more to study or see, so the information that we do have about the animal comes from scientists studying fossils and other evidence. However, if you watch the movie Jurassic Park III, you can see a Spinosaurus in action (of course recreated using special effects). How do scientists classify Spinosaurus? Some key facts about Spinosaurus. 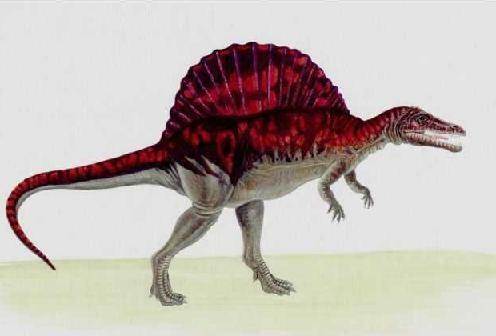 What was Spinosaurus's fin for?. What Spinosaurus fossils have been found? Where were they discovered? How did Spinosaurus get its name? What does its name mean?